The company also coined a new buzzword Wednesday - it says we're in the era of "Search 2.0"
Microsoft's top search executive has tried to play down the significance of Google Instant, which was launched in September with much fanfare, saying it "gets in the way" of users and that reactions to it have been "mixed at best." "We think speed to task completion is better than speed to results," Satya Nadella, senior vice president for R&D with Microsoft's Online Services Division, told reporters when asked about the technology at a San Francisco press event Wednesday. Google Instant displays search results immediately when a user starts typing a query, and updates them in real time as additional letters are added. Google calls it a powerful technology that can shave valuable seconds off the time it takes to do a search. Microsoft is studying Google Instant and has done its own tests to see how people react to it, but it's not clear that users like to have results flashed up on the screen "when you don't expect them," Nadella said, claiming results from its tests have been "mixed at best." "As a universal approach for every query it probably gets in the way," Nadella said, although he allowed it might be useful in some situations. Google users can turn off Instant Search at the Google preferences page if they don't like it. Nadella claimed Microsoft already has a kind of instant search for some queries, such as when a user types "weather" and the first few letters of a city as well as the weather for the city Bing thinks the user is looking for pop up in a box. Google Instant is "not a game changer," he concluded. 'It's a nice feature." Google disagreed, calling it one of its most successful updates since Universal Search. "During extensive user testing we made many subtle improvements to arrive at the compelling experience we eventually released. Google Instant is not just fast, it is smart," the company said. Whatever people think of the technology, it didn't help Google avoid a slight dip in its commanding market share last month. Google ended November with 66.2 per cent of searches, still far ahead of Microsoft but down a tenth of a percentage point from the month before, according to new figures from comScore. Microsoft ended the month with 11.8 per cent, up from 11.5 per cent in October. Yahoo's share slipped from 16.5 per cent to 16.4 per cent. 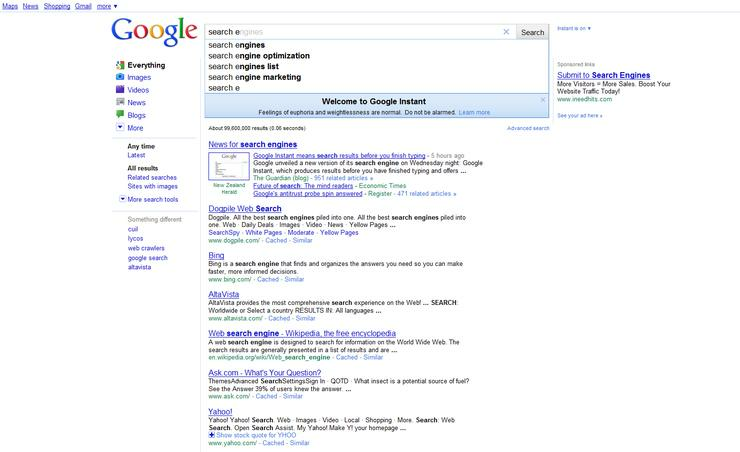 Perhaps ironically, Yahoo had an equivalent of Google Instant as far back as 2005 but dropped it, the website SearchEngineLand reported recently. Microsoft announced a raft of mostly minor new features for Bing on Wednesday. Among the biggest are allowing Facebook users to "like" search results and influence which results their friends see, and adding Streetside to the mobile version of Bing Maps. Search has stopped being such a passive activity and become more interactive, just as the Web did years ago, according to Blaise Aguera y Arcas, the architect for Bing Maps. We've entered an era of "Search 2.0," he said. One way Microsoft hopes to gain ground on Google is by making it easier to complete tasks within Bing. Updates to the service announced Wednesday allow people to search for a sports event, view the seating plan for a stadium, see the view from a seat and buy a ticket, all without leaving Bing. "Search 2.0 is analogous to Web 2.0," Aguera y Arcas said. "The Web used to be a consumption-only sort of experience -- just reading. In Web 2.0 you interact with applications, things you do have side effects in the real world, like booking a restaurant or banking. We see a lot of those same kinds of transformations happening now with search." "I think it's a buzzword worthy of being coined," he said. "Search 2.0."